Researchers have developed an imaging technique which will allow scientists to study light elements such as carbon and oxygen using 'hard' x-rays. 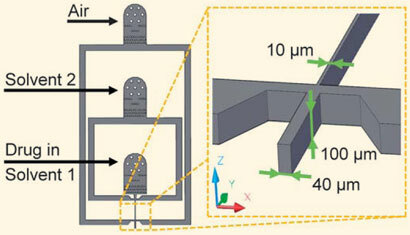 They say the new form of imaging could be used to study reactions in situ. In traditional x-ray imaging, x-rays are passed through a sample to create an image based on absorption of the material. 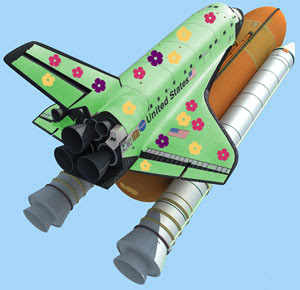 Multiple images can then be reconstructed by computer to create a three-dimensional image. 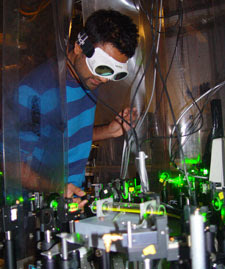 Often researchers combine this imaging with spectroscopy, to gain information about the chemical environment of an element. However, problems arise when looking at lighter elements such as carbon, oxygen and nitrogen, which require 'soft' x-rays. These x-rays are not powerful enough to penetrate larger samples, and so can only provide information about what's happening at the surface of a material. 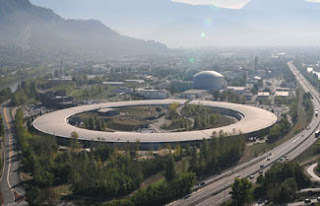 A joint project between the University of Helsinki, Finland, and the European Synchrotron Radiation Facility in Grenoble, France used inelastic scattering, instead of transmission of x-rays, to solve this problem. The technique involves passing a slicing x-ray beam down the length of the sample, to detect how much radiation is scattered by the material. The team can then obtain two-dimensional slices, which can be pieced together to give a three-dimensional image, without any computational reconstruction. Inelastic scattering provides information about the chemical environment a chemical is in without the need for soft x-rays. 'So now we have a technique which is sensitive to carbon, oxygen and other [light] elements but is not restricted to the surfaces of samples or very tiny samples,' says author Simo Huotari. The technique has been used on samples 1mm to 1cm thick. The team have already tested their technique on a sample containing both diamond and graphite. 'Graphite has sp2 carbon and diamond has sp3 carbon so we can differentiate them from the spectra of the sample,' says Huotari. The penetrating x-rays allow researchers to study in situ reactions in extreme environments, or in containers such as in batteries or fuel cells. 'It's highly sensitive to chemical environments so you're able to scan materials and see how the chemistry in them changes,' says Christian Sternemann, an expert in inelastic x-ray scattering at the Technical University of Dortmund, Germany. 'The technique has great promise as a characterisation and analytical tool in many areas of chemistry and materials science,' adds Neal Skipper, a professor of physics at University College London, UK. The EU is banning the use of cadmium, a heavy metal carcinogen, in plastics, jewellery and brazing or soldering sticks from December this year. The move has been welcomed by industry but has raised concerns among environmentalists because the EU initiative includes various derogations or exemptions allowing continued or even increased use of recycled PVC products, which use cadmium as a stabiliser. The ban is being introduced under the Reach legislation which enables restrictions to be imposed on specific hazardous substances. However, it does not apply to cadmium in electrical and electronic products which are controlled by the Regulation on Hazardous Substances (RoHS) directive. As humans obtain much of their daily intake of cadmium from food, the European Food Safety Authority (EFSA) conducted an investigation two years ago, which concluded that the mean exposure of European adults was close to, or slightly exceeded, the tolerable weekly intake (TWI). Some subgroups may receive double their TWI. Besides being carcinogenic, cadmium poisoning can be fatal, damaging organs, such as the lungs and kidneys, via inhalation of fumes. It may also be genotoxic and damage the nervous system. Cadmium fumes can be a major health risk during the application of cadmium-bearing brazing alloys for metal joining in plumbing, refrigeration and ventilation and in recreational model-making. There has also been a recent increase in imports of imitation precious metal jewellery containing cadmium. Some of it is 45 per cent cadmium and the metal can pass through the skin on contact. Since the early 1990s the EU has restricted the use of cadmium as a colourant and as an additive in plastics because of the dangers it poses to the health of workers. The new ban tightens up and closes loopholes in existing legislation on cadmium in plastics. In the PVC sector, for example, a concentration limit of 100ppm applies to products such as pipes, flooring and cabling but not to windows, and other profiles, and roofing. As a result recycled PVC is used for window profiles but not for pipes. Under the legislation recycled PVC can be used in non-pressure pipes up to a limit of 1000ppm, which will also be imposed on recyclates in profiles and other construction applications. The Commission has taken a similar line with recycled PVC containing cadmium as it did with cadmium in solar panels in last year's revamped RoHS. Solar panels were exempted from a cadmium ban on the grounds that they would be recycled. As the disruption to air travel caused by the eruption of the Grimsvötn volcano in Iceland subsides, researchers are taking a close look at volcanic ash to try to understand how hazardous it is to both aircraft engines and human health. When Grimsvötn exploded on 21 May sending a column of ash and steam 20km into the sky, a sense of déjà vu was palpable. Last April another Icelandic volcano, Eyjafjallajökull, stirred into life causing widespread flight cancellations, costing the airline industry billions. The two eruptions both produced fine particles of ash, but were geologically dissimilar. The ferocity and pattern of an eruption is influenced by a variety of factors. An eruption occurs when molten rock from the Earth's mantle - magma - finds its way through the crust to the surface. In Iceland the magma is largely basaltic, consisting of silica (SiO2) and metal oxides. Volatile compounds such as water, sulphur dioxide and carbon dioxide are also present in the magma, and can affect the eruption. Silica content is crucial because it largely dictates the viscosity of the magma - the more silica the 'stickier' the magma. As the magma approaches the surface, dissolved volatiles become gaseous. If the magma is silica poor and relatively 'runny', these gases escape easily. If the magma is silica rich and viscous, pockets of trapped gas expand and eventually explode, shattering the surrounding magma and producing fine ash particles. As basaltic magma met the ice, steam was created providing new energy to shatter the erupting magma, producing yet more ash and debris. 'The two eruptions illustrate beautifully how fine-grained ash can be produced in two quite different ways,' says McGarvie. 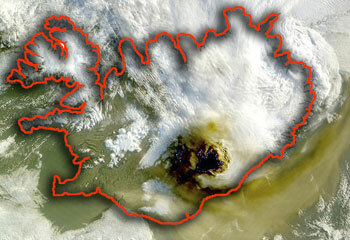 Meanwhile, researchers have completed a study into the dust thrown up by last year's Eyjafjallajökull. A team led by Sigurdur Gíslason of the University of Iceland and Susan Stipp of the University of Copenhagen, Denmark, has assessed the potential of ash to harm aircrafts and human health. Early studies suggest that while ash from both sites was fine-grained, that from Grimsvötn was slightly coarser than that from Eyjafjallajökull: 50-65 per cent of Grimsvötn ash on the ground was less than 60?m in diameter, compared with 45-70 per cent of that from Eyjafjallajökull, but the figures for grains less than 10?m across were less than 10 per cent, and 15-22 per cent respectively. 'Particles smaller than 60?m can be kept in suspension in air for days, and particles smaller than 10?m pose health problems,' Gíslason tells Chemistry World. The ash from Eyjafjallajökull is dominated by andesitic glass and crystals of plagioclase, pyroxene and olivine, Gíslason says. The hardness of this ash is comparable to titanium and much harder than the exposed surfaces of an aircraft. The team carried out a series of tests on ash collected immediately after the Eyjafjallajökull eruption. They found that some of the grains were composed of nanoparticle aggregates which were sharp and jagged - adding to their potential abrasiveness. 'The speed with which an airplane would interact with a plume of very fine-grained ash would ensure that even nanoparticles would have the necessary momentum to wear surfaces, especially particles that are sharp and hard,' the researchers say. The Eyjafjallajökull ash glass melts at 1,147 °C. 'Thus, the ash would easily melt in a jet engine, which reaches temperatures of 1,500-2,000°C,' Gíslason says. A polymer-based device that can walk caterpillar-like across a surface has been developed by researchers in China. The marching machine, which steps out in response to swings in humidity, was made by Junqi Sun and colleagues at Jilin University in Chanchun. The device is based on a water-absorbing hydrogel polymer film, which is tightly bonded to a flexible humidity-inert polymer support. The hydrogel layer absorbs water and expands in response to rising humidity, while the underlying support remains unchanged. This mismatch means the two layers bend as the hydrogel expands, and then relaxes as the humidity falls. The researchers controlled the humidity by alternately blowing dry and then moist nitrogen over the film, causing the relative humidity to swing from 11 to 40 per cent. 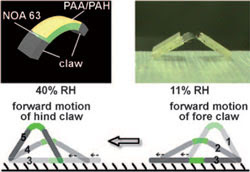 By attaching 'claws' to each end of the bilayer, and standing it on a rough surface, the bilayer can walk in a single predetermined direction when subjected to humidity swings, while carrying a load up to 120 times its weight. A particular set of properties are needed for the hydrogel to form a powerful actuator, says Sun. It must retain its stiffness when swollen with water, have a high rate of moisture expansion, and rapidly absorb and desorb water. 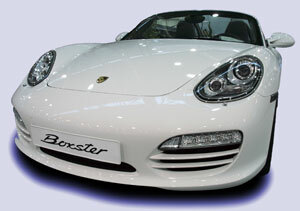 To achieve this, Sun used a polyelectrolyte multilayer layer (PEM) film, which is made from alternating layers of oppositely charged polymers. 'We believe that many PEM films can be used to fabricate powerful actuators because the layer-by-layer assembly enables precise control of compositions, structures and properties of PEM films,' Sun says. While such stimuli-responsive materials have been seen before, 'the neat thing here is that they have built it into a cool-looking device - it sparks the imagination as to what you could actually do with it,' says Geoffrey Spinks, who researches polymer-based actuators and sensors at the Intelligent Polymer Research Institute at Wollongong University, Australia. Spinks says that, because humidity is relatively hard to control, it would be difficult to use the actuator for any practical applications, unless it was being used as some sort of humidity switch. 'But maybe you could tune it to absorb other chemical vapours,' he adds. However, Sun is already looking for alternative ways to drive the device. 'We believe that PEM film-based walking devices driven by other stimuli, such as light, temperature and so forth, can be fabricated,' Sun says. 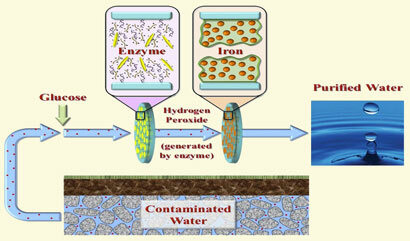 'IR irradiation can induce the evaporation of adsorbed water in PAA [polyacrylamide]/PAH [poly(allylamine hydrochloride)] film, and therefore, shrinking of PAA/PAH film,' he says. Teams from the US and Germany have developed a spray drying technique to fabricate drug formulations smaller than 100nm for pharmaceutical trials, improving the drugs' solubility, or bioavailability. Over the last decade, the molecular complexity of drugs has increased significantly, leading to poor solubility, which means that the compounds can't be used in the human body. To determine if new formulations have potential as successful drugs, solubility tests are run at an early stage of development. However, the amount of drug available for these tests is usually very small. One way to get around this problem is by decreasing the compounds' particle size. David Weitz from Harvard University, Cambridge, US, and colleagues, have done just that by developing a microfluidic device made from poly(dimethylsiloxane), incorporating two flow-focussing streams and a third for compressed air to form a spray, that can generate particle sizes below 100nm. The team tested the device using the drug danazol. They dissolved danazol in an organic solvent and injected it into the first stream and injected another solvent into the second stream. The two solvents met the compressed air at a cross-junction, forming a spray, which causes the solvents to evaporate and the compound to be produced as a fine powder on a collection area. Changing conditions such as the distance of the spray nozzle from the collection area and the air pressure allowed the team to control the size of the nanoparticles. As well as nanoparticles, the design also allows drug co-precipitates and nanosuspensions - which enhance solubility - to be made, by co-spraying two substances. Weitz says that work is being performed to explore the possibilities of scaling up the technology to produce larger drug quantities. Scientists in the UK have moved a step closer to understanding how ibuprofen could help treat cancer. The findings could lead to the drug being used as a preventative treatment for prostate cancer, in the future. Ibuprofen - a common painkiller - can help reduce the risk of prostate cancer, but the mechanism by which it inhibits tumour cells is still not fully understood. 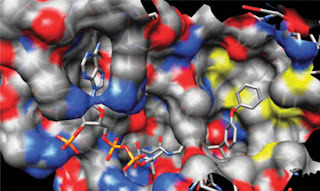 Now, Matthew Lloyd and his team from the University of Bath in the UK, in collaboration with Cancer Research UK, have uncovered a mechanism suggesting that the chiral inversion of ibuprofen inhibits the activity of the protein alpha-methylacyl-CoA racemase (AMACR), levels of which are increased in the presence of prostate, some colon and other cancers. Lloyd explains that AMACR catalyses the chiral inversion of 2-methyl-fatty acyl-CoA esters, which are thought to be related to tumour cell growth. 'We would like to produce a chemical that binds really tightly to the protein [AMACR] and stops it working, because that would be a potential treatment for prostate cancer,' he says. The team decided to study whether AMACR would catalyse the chiral conversion of ibuprofen from its R-enantiomer to its S-enantiomer (the active species that is used to treat inflammation) instead of catalysing the chiral conversion of 2-methyl-fatty acyl-CoA esters, thus resulting in a chemopreventive effect. First they converted a racemic mixture of ibuprofen into its coenzyme A ester to make a substrate for the AMACR to bind to. They then observed that the R-enantiomer of the ibuprofen-CoA ester bound tightly to the AMACR, resulting in 50 per cent being converted to the S-enantiomer - this involves removal of the R-ibuprofen alpha-proton followed by non-selective reprotonation. The cycle was repeated, so that you end up with a net conversion of R to S. Lloyd explains that the significance of the finding is that while AMACR is doing the chiral conversion of ibuprofen, it is not able to promote cancer growth. In addition, the net conversion of R-ibuprofen to the active S-ibuprofen means that all of the drug can be used for its inflammatory effect. 'The fact that the AMACR is able to convert the R-ibuprofen into S-ibuprofen is not new, but it has never really been demonstrated before that this is a general phenomenon that applies to several of the drugs in the same class,' says Aurelie Courtin, a drug development expert at the University of Cambridge, UK. However, she indicates that at present ibuprofen cannot be used as a preventative treatment for cancer. 'Further experiments are needed to prove its anticancer effect; in vitro first on different cancer cell models and then in vivo. Furthermore, as it would be a long term treatment, it is important to study its toxicity - mainly on the liver - and its side effects,' she adds. Lloyd agrees that ibuprofen should not be seen as a wonder drug just yet. 'There is still a long way to go and further work is definitely needed,' he says. UK scientists have made the most accurate measurements to date of the shape of the electron and found - contrary to predictions that it would be aspherical - that it remains round. Particle physics currently explains phenomena according to the standard model. However, there are some big puzzles that it cannot solve, including why little antimatter is found in the universe. Physicists believe the standard model is incomplete and the dearth of antimatter must be explained by new, undiscovered particles. However, while the standard model predicts that the electron will be almost perfectly round, any new model that involves additional particles should mean that electrons will appear slightly aspherical because of a distortion characterised by the electron's electric dipole moment (EDM), a measure of the distribution of the electric charge across the electron. 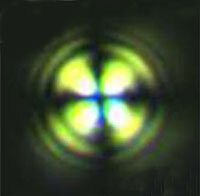 The team investigated the electron's EDM using a laser to prepare the spin of YbF molecules. If the direction of the spin of the electron in the YbF molecules changes following the application of an electric field then it would indicate an EDM. However, the team observed no such change. Mars, the magnificent Red Planet that has inspired a thousand science fiction fantasies, is just a baby - it has never grown up. Scientists in the US have analysed isotopes in meteorites that resemble Martian geology and have discovered that the planet stopped growing while its solar system siblings carried on developing. This would account for the fact that Mars is 10 times smaller than Earth. Planets are thought to have evolved from dust particles that collided and stuck together, forming objects called planetesimals. These in turn coalesced to create 'embryos', which further condensed with one another to form planets. Each of these processes takes millions of years. But researchers have now shown that Mars stopped developing only 2-4 million years after the formation of the solar system. Earth, on the other hand, carried on growing normally until it reached 'adulthood' about 50 million years later. 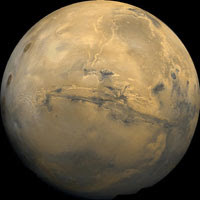 Nicolas Dauphas of the University of Chicago and Ali Pourmand, of the University of Miami, looked at isotope ratios in meteorites known to have a similar composition to the Martian mantle - the layer surrounding the core. They measured the decay of hafnium-182 into tungsten-182 using inductively coupled mass spectrometry. When planetismals collide to form an embryo, the metal content of the incoming mass migrates to the core of the resulting body. So when an embryo is formed, it will have almost no metal within its mantle. If there is tungsten-182 in the mantle millions of years later, this will have come from the decay of hafnium, and so the age of the sample can be calculated. 'It is a very accurate tracer of what happens in the first few tens of millions of years,' Dauphas tells Chemistry World. US sustainable chemicals company Genomatica has demonstrated a commercially viable approach for turning sugar into 1,4-butanediol (BDO) - a globally important petrochemical intermediate - using a metabolically engineered strain of E. coli. The researchers behind the work say it could offer a cost effective and green alternative for producing BDO and other major chemicals using a wide range of renewable feedstocks. BDO is a well established commodity chemical. Around 1.4 million tonnes are produced each year, with a market value of $4 billion (£2.5 billion). 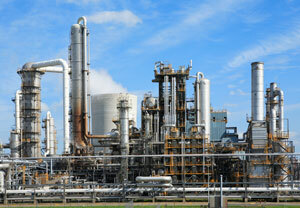 It is used to manufacture a huge range of industrial and consumer products, including solvents, plastics and spandex. However, almost 98 per cent of the world's chemicals, including BDO, are made from oil or natural gas, giving producers big carbon footprints and leaving them at the mercy of high oil prices. There is therefore much interest in finding economical ways to produce chemicals from renewable feedstocks. The team used an algorithm to predict biochemical pathways that could turn key E.coli metabolites into BDO. They then identified enzymes in other organisms that could catalyse these steps and selected the best ones to assemble a non-natural pathway. 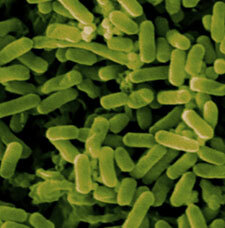 This pathway was then expressed in E. coli that was engineered to direct carbon and energy resources to BDO production. Prather is also impressed that the engineered microbe was able to produce BDO at concentrations of 18g per litre. Although this is not high enough for commercialisation, it is a significant feat because these concentrations would ordinarily kill the cell. Genomatica expects to open their first commercial plant by the end of 2013, producing around 45 million kilogrammes of product per year. What's more, the fermentation and separation processes to obtain bio-BDO are simpler, cheaper, use less energy and operate at lower temperatures and pressures than conventional petrochemical methods. 'As a result, our process plants can economically be "right-sized" to the needs of a customer or region, and be located closer to feedstock and/or customers,' Van Dien says. Scientists at the University of Iowa, US, have discovered a new bacterium that feeds on caffeine. They claim it could synthesise various drug molecules and intermediates, and might even be used to decaffeinate coffee waste to use as a feedstock for biofuel production. 'We were looking for some form of caffeine-degrading bacterium as we were looking to develop a diagnostic dipstick test for caffeine,' explains researcher Ryan Summers, who presented his work at this week's American Society for Microbiology meeting in New Orleans, US. 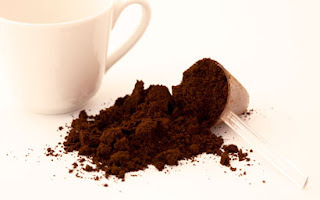 They took a soil sample from a flowerbed outside the lab, cultured it, and found it contained a new caffeine-eating strain of Pseudomonas putida. Although bacteria that feed on caffeine have been isolated in the past, the mechanism was a mystery. Summers isolated three enzymes from the culture that remove caffeine's three N-methyl groups, along with the genes that encode them. A number of drugs are derived from xanthine, the non-methylated parent compound of caffeine, notably stimulants used in heart conditions and bronchodilators to treat asthma. However, Summers says turning caffeine into these sorts of drugs is difficult because it's hard to change the substitution on the N atoms in a controlled and specific way. 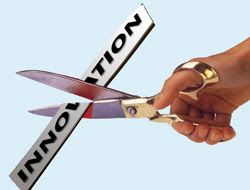 The UK government's cost-cutting policies are in danger of stifling innovation, according to a report from The Work Foundation. In the report, Making the most of public services: a systems approach to public innovation, author Charles Levy argues that there is a real danger that rapid, swingeing cuts across the board will cut innovation along with spending. Levy estimates the government spends about £50bn a year on knowledge-based assets. Although these are the key drivers of innovation, he says there is little understanding of how this innovation can be supported to give the best value for money. The government should learn from the private sector how spending can support innovation and boost value for money through investment. While he says the NHS had started establishing bodies to make it more receptive to innovative goods and services, many have had their funding cut. 'The debate isn't focusing on building a healthcare system that works with suppliers to create and develop innovative products that they could then export, but a narrow accountability debate, neglecting this issue,' he says. Imran Khan, director of the Campaign for Science & Engineering, says many issues raised in the report highlight the need for a long-term government strategy for science and innovation. 'Until we can set agendas showing the UK will support science and engineering wholeheartedly over decades, rather than just the four or five years between elections, we will struggle to make people around the world see the UK as a great place for science.' The report was right to stress immigration as an issue, he adds. French researchers have used highly sensitive mass spectrometry to help solve a key question surrounding economic inflation in Europe during the 16th and 17th centuries. For decades historians have argued about why there was a gradual but inexorable increase in prices in Europe between around 1520 and 1650 - known as the great Price Revolution. One influential school of thought postulates that the inflation was due to the Spanish economy being flooded with Mexican silver coins. Now, Anne-Marie Desaulty and colleagues from the University of Lyon have carried out high-precision isotope analysis of coins from Europe and the Americas from the relevant period and shown that there was no huge influx of Mexican silver into Spanish coinage at this time. Analysis of isotopes of lead and copper, both found in coins of the time, have been used to establish the provenance of coins: ores from different regions can have different isotope signatures. However, lead isotope ratios can be difficult to distinguish, and copper from other sources was often added to coins later on if the coins were re-minted. Analysis of silver isotopes has until recently been too tricky because the ratio of its two stable isotopes, silver-107 and 109, has been difficult to measure accurately. Now, multiple collector inductively coupled mass spectrometry is sufficiently sensitive to obtain a meaningful isotope fingerprint from samples and spot the source of the silver ore used in the coins. The researchers profiled copper, lead and silver isotopes from coins from Europe and the Americas. The results showed that Mexican silver did not enter Spanish coinage from the 16th century to the beginning of the 17th century. 'On the other hand, Spanish coins struck under the reign of Philip V [1700-1746] have a purely Mexican signature,' Desaulty says. 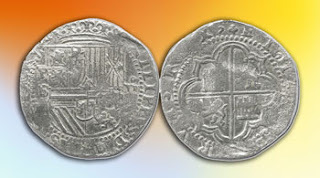 The findings suggest that inflation in Spain during the 16th and 17th centuries did not correlate with a massive influx of Mexican silver into Spanish currency, but that it took 80 years for Mexican silver to completely replace European silver in Spanish coinage. 'The results thus call into question the secular idea that the "prices revolution" is related to the massive arrival of American metals,' Desaulty says. Government plans to cut UK greenhouse gas emissions risk crippling the chemical sector and thereby harming chances of moving to a low emissions future, according to a report by think tank Civitas. Meanwhile, the chemical industry has cautioned that companies will suffer if they do not receive effective support during the transition. In its so-called carbon budget, the UK government has set itself the target of halving emissions, compared with 1990 level, by 2025, a target that will be written into law. The EU has already set member states the goal of cutting greenhouse gases by 80 per cent by 2050. In 2010, UK emissions were 25 per cent below the 1990 level. 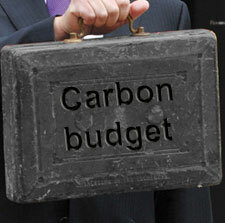 The government will review progress in 2014 to see how domestic targets are aligning with targets calibrated using the EU emissions trading scheme (ETS). 'We will, as appropriate, revise up our budget to align it with the actual EU trajectory,' said energy and climate change secretary Chris Huhne in his speech to parliament. As an energy intensive heavy industry, the chemical industry is strongly affected by changes in energy prices, which could rise as low emission technologies are encouraged. The Civitas report says that the carbon budget will therefore hamper the chemical industry, thereby holding back the development of innovative green products, which typically incorporate chemical products. In particular, as costs increase, more chemical companies will move their activities outside the UK, it says. According to the UK Chemical Industries Association (CIA), manufacturers in the UK already face the highest energy related costs in Europe. 'Transitional support measures must be effective or industries that make carbon saving products will be wiped out,' says chief executive Steve Elliott. The UK government has told the Technology Strategy Board (TSB) it needs to learn from previous failures if it is to turn academic research into economic success as it rolls out the technology and innovation centres (TICs). The advice came in a point-by-point response to the Science and Technology Committee's TICs report. TICs were announced in the UK 2010 spending review as 'an elite network of research and development intensive technology and innovation centres'. The government and TSB, the UK's national innovation agency that has the goal of stimulating economic growth by harnessing research, are planning to co-opt the almost 40-year-old German Fraunhofer model. The government will provide one third of the funding, with the other two thirds coming from competitive public-private funding and directly from the private sector. The report cites the Faraday Partnerships, which struggled because of 'the lack of reliable core funding'. The committee says 'the promise of £200 million core funding over the next four years from government is an acceptable foundation for the TICs initiative'. Established in the 1990s, the Faraday Partnerships became too dependent on commercial income, losing their innovative edge. The TSB has already fast-tracked its first TIC in advanced manufacturing, which was awarded to a consortium led by the University of Sheffield Advanced Manufacturing Research Centre and Boeing. A call for a cell therapeutics TIC has also been put out. The TSB expects to fund between six and eight TICs in a range of priority sectors. Government funding for TICs came from the closure of the Regional Development Agencies (RDAs). A delicate balance will need to be struck now - removing funding from existing RDA centres will create an economic imbalance and a loss of expertise, while locating TICs in places supported by a strong research base with the ability to collaborate with the TICs will have the greatest impact on economic growth. 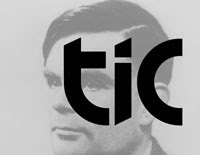 The government also agreed with the Committee proposal to name the TICs Turing Centres, after the mathematician and computer pioneer Alan Turing. A new government-commissioned review of UK copyright laws is recommending major changes that would have not only a major impact on the music and film industry, but also on scientific research. The 132-page Digital Opportunity report, written by a committee headed by Ian Hargreaves, professor of digital economy at Cardiff University, says that the UK is still operating under archaic copyright laws, while other nations are adapting to the digital age. The report estimates the UK economy would be boosted by £5.5 billion to £7.9 billion a year if its recommendations were adopted. The proposals of most interest to researchers call for new regulations to allow digital copying of medical and other journals for computerised analysis. Another recommendation would permit access to so-called orphan copyrighted works, which remain locked because authors are not known or can't be traced. Robert Kiley, head of digital services at the Wellcome Trust, which spends about £600 million annually to fund medical research, tells Chemistry World that the foundation strongly supports the two recommendations, saying that the current system is not compatible with the digital age and acts as a major barrier to research and innovation. 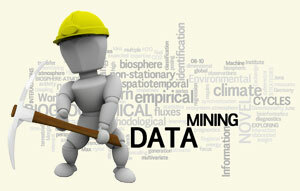 Describing already published research as 'a vast, and largely untapped, resource,' Kiley says text and data mining tools enable researchers to 'identify new connections and associations within this immense and rapidly growing knowledge base and generate vital new insights that will lead to considerable health and economic benefits'. Asked whether he feels UK researchers should be speaking out publicly in support of copyright reform, Kiley says: 'In general, we would support and encourage scientists in engaging in policy discussions that impact research. Indeed, the presentation of examples in different fields where existing copyright provisions are creating barriers for research and innovation will be valuable in continuing to make the case for reform. A parasitic pest that can devastate entire fields of vegetable crops is a step closer to being brought under control, thanks to the synthesis of a compound that tricks its eggs into hatching early. The pest in question, the potato cyst nematode, is a millimetre-long worm that feasts on a family of flowering plants that includes tomatoes and aubergines, as well as potatoes. 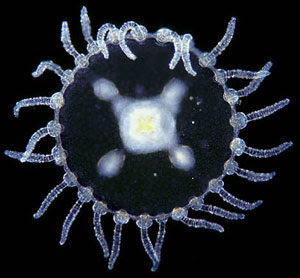 Its eggs can lay dormant in the soil for more than 20 years before hatching when they detect their host plant. 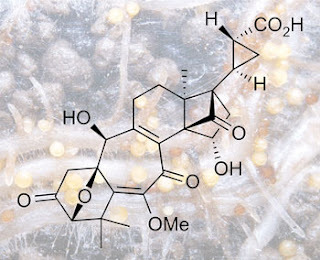 The trigger that causes the potato cyst nematode to hatch out and start feasting is a compound released by the host plant itself called solanoeclepin A. 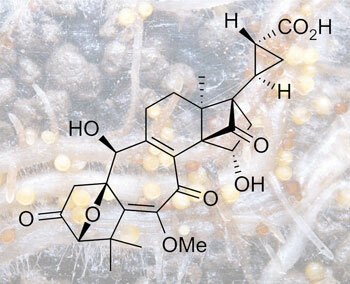 The Japanese team, led by Keiji Tanino at Hokkaido University in Sapporo and Masaaki Miyashita at Kogakuin University in Tokyo, have just completed the first total synthesis of solanoeclepin A, giving hope that this crop pest could one day be brought under chemical control. The idea would be to trick the nematode into hatching out early, as once hatched the worms die within a few weeks in the absence of their host plant. However, solanoeclepin A is only produced in minute amounts by the crop plants, so the only way to produce enough of it to treat infected soil is by chemical synthesis. Solanoeclepin A is a densely functionalised heptacyclic structure, whose carbon backbone includes carbocycles of every size from three-membered up to seven-membered rings. Its construction required 52 steps, some of which were developed especially for this synthesis, says Tanino. 'We felt great difficulty in the late stages of the synthesis, because there are many functional groups on the intermediates,' he adds. The synthesis produced 5mg of the natural product, which has been used for biological testing. Tanino and Miyashita are already looking for simplified derivatives of solanoeclepin A, which retain the bioactivity of the natural product but are much easier to synthesise. During the total synthesis, the researchers also prepared various segments of the compound to test for bioactivity. 'The left side of the compound might be essential, or it might be the right side - no one knows that yet,' says Tanino. A cheaper alternative to the Haber-Bosch process could have moved a step closer thanks to a new ruthenium-based catalyst complex developed by chemists in Germany. Each year the Haber-Bosch process produces millions of tonnes of ammonia for the fertiliser industry by direct hydrogenation of nitrogen with hydrogen gas over a catalyst. However, this process needs temperatures of around 450°C and pressures of 300 bar, consuming vast amounts of energy. Now, a team led by Sven Schneider at the University of Erlangen-Nürnberg and Max Holthausen at the University of Frankfurt have shown how a ruthenium complex with a nitrogen-metal triple-bond can split molecular hydrogen to produce high yields of ammonia at atmospheric pressure and temperatures of only around 50°C. The finding could point the way to solving the 'second half' of the Haber-Bosch process, the activation of hydrogen and hydrogenation of a nitrogen atom to create ammonia. 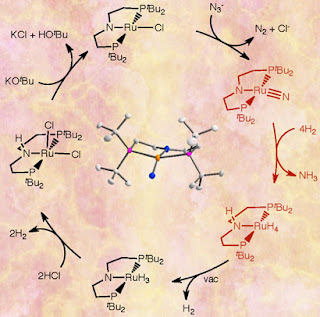 The German researchers synthesised a planar molecule with a ruthenium centre clamped by a nitrogen and two bulky flanking phosphine groups - known as a PNP pincer ligand. A nitrido ligand triply bonded to the ruthenium can then be introduced with an azide. This ligand combine with the hydrogen to form ammonia. The mechanism of H-H bond cleavage that the team proposes has the first hydrogen atom moving to the nitrogen of the pincer with the other remaining on the ruthenium. This latter hydrogen is then transferred to the terminal nitrido ligand. This reaction repeats twice more to produce ammonia. 'A key aspect of the system is the cooperative nature of the metal-pincer ligand fragment,' says Schneider. 'Both the transition metal centre and the ligand are crucial for the reaction to proceed. We have essentially modelled the second half of a Haber-Bosch type hydrogenation of nitrogen in solution.' The next step is to try to find a way of splitting dinitrogen to obtain the single nitrogen attached to the ruthenium complex. Scientists in Japan have made a 'superconducting sandwich' from two materials are not superconductors in isolation. The technique could be used to make electronic circuits with extremely low power consumption, the researchers suggest. A team led by Masashi Kawasaki of Tohoku University fabricated a transistor by depositing electrodes on a surface of potassium tantalum oxide (KTaO3). This was then covered with a drop of an ionic liquid consisting of diethylmaleic acid ester (DEME) cations and boron tetrafluoride anions. 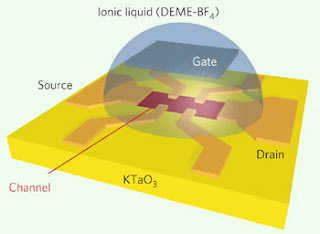 It has been shown in the past that when a drop of an ionic liquid is placed on KTaO3, a double layer forms at the interface with a gap of around 2nm. When a voltage is applied across this gap, charge accumulates electrostatically on either side, making the component analogous to a capacitor. The researchers gradually lowered the temperature of the system and measured the conductivity across this gap. 'First, it is totally insulating, then semiconducting,' says Kawasaki. 'Next, it becomes metallic, and then it becomes superconducting when the temperature reaches 0.005K - very close to absolute zero.' Although the ionic liquid freezes at around 200K (-70°C), once the voltage is applied, the charge remains confined to the solid near to the surface. 'Zero resistance could be useful for low power consumption logic circuits,' Kawasaki says. It seems that when the system is charged, electrons from the electrodes migrate to one face of the gap; as the temperature drops these electrons can move more freely until, eventually, a state of zero resistance is reached. Japanese pharma company Takeda is to acquire Swiss-headquartered rival Nycomed for 9.6 billion. If the antitrust authorities give the go-ahead, the takeover should be completed by late summer. Takeda has a strong presence in its home market and the US, and the acquisition will give it an expanded presence in Europe and the all-important high-growth emerging markets, where Nycomed has a good market share. The deal also expands its product portfolio into the respiratory area with Daxas (roflumilast), which Nycomed obtained when it bought German company Altana in 2006. This treatment for chronic obstructive pulmonary disease - common in long-term smokers - has good growth potential, both in chronic obstructive pulmonary disease and potential future indications such as asthma. According to Nigel Borshell, director at consultancy PharmaVentures, the deal looks quite expensive at more than three times annual sales, and Nycomed has debts of 5.5 billion. 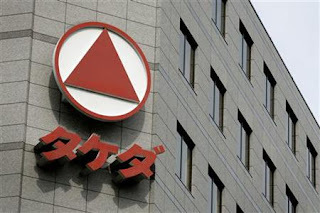 However, the patent on Takeda's biggest selling product - anti-diabetes treatment Actos (pioglitazone) - will soon expire, and Nycomed's annual sales of around $4 billion are about the same as the drug's. The US Environmental Protection Agency (EPA) has indefinitely delayed rules governing emission of toxic air pollutants from boilers and certain solid waste incinerators at chemical plants and other major industrial facilities. The move comes in response to pressure from industry groups. The postponement of the rules, while the EPA carries out a formal reconsideration process under the Clean Air Act, has pitted the American Chemistry Council (ACC) against environmental advocates. The new rules would limit emissions of nine different pollutants, including cadmium, sulfur dioxide and particulates. The EPA's 16 May decision will extend the deadline for public consultation before the standards come into effect. Thousands of facilities across multiple industries would need to make significant investments to bring plants up to standard. The EPA says the delay is due to the almost 5000 comments it received. The agency is also responding to petitions by various industry groups for administrative and judicial review of the rules. But environmental groups are less enthusiastic. Earthjustice says that what the EPA has delayed is an effort to reduce and limit emissions of several air pollutants, including mercury, lead and dioxins. The EPA has estimated that these rules would save up to 6500 lives each year by 2013. Nevertheless, last month the ACC joined others - including the American Petroleum Institute, the US Chamber of Commerce and the Society of Chemical Manufacturers and Affiliates - in requesting that the EPA issue an immediate stay of the rules. Specifically, they argued that chemical production facilities with existing coal-fired boilers would suffer 'irreparable harm' due to the ultra-low emission standards and would struggle to meet the 20 May deadline. Furthermore, industry groups said the dioxin emissions standards and related requirements are 'fundamentally flawed and unachievable'. In a 27 April letter to the EPA, they note that facilities will have to undertake extensive performance testing and analysis to better gauge how to operate each affected unit to achieve compliance, noting that each performance test costs between $10,000 (£6155) and $20,000 per unit with many companies having multiple units. The stay will remain until either the EPA decides the new rules can proceed or the judicial review is completed. The public consultation will remain open until 15 July. Italian authorities have exposed a vast web of phony research projects that stole more than 50 million from the European Commission. The projects, which ran across seven EU countries, covered a wide range of different topics, from road safety to healthcare. A total of 22 projects are now under investigation for receiving EC funds fraudulently. The authorities have uncovered a network of companies and organisations, many of which turned out to be fictitious, based in the UK, France, Greece, Austria, Sweden, Slovenia and Poland. The European Anti-Fraud Office (OLAF) and the Commission have been working together with local authorities to fight a number of sophisticated frauds involving European research funding. The research projects were cleverly designed so as to evade the Commission's control mechanisms. They all passed peer review as their applications and goals were well presented and the consortia appeared to include organisations from the public and private sector. The projects' organisers stand accused of falsifying grant applications, reporting inflated costs, false accounting and claiming money for researchers that did not exist or were completely unaware of their stated involvement. The authorities are still investigating how the research funding has actually been spent. In a previous case, researchers at several Greek universities stood accused of embezzling European research money to buy Porsches and fund lavish lifestyles. In this instance 150-200 million is thought to have been misappropriated. Although the investigation is still ongoing, the companies and organisations under suspicion have had their projects terminated and have been banned from applying for any future EC funding. Of the 50 million that has been allocated for the suspected fraudulent research, the EC has recovered 10 million and is seeking to recover the remainder through the courts. Scientists in Europe and the US have designed a molecule that can be manipulated using light to carry out multiple and distinct logic functions. The multifunctional molecule, which can be reconfigured by light, could be used in data storage devices and biomedicine, including nanoparticle tracking and drug delivery. Although molecular logic devices are not new, most have only ever managed to carry out single logic operations. Therefore, many different molecules, and different logic devices based on these, would have to be used and coordinated to carry out a set of logic manipulations. Furthermore, most molecules logic devices require some form of chemical input to function. 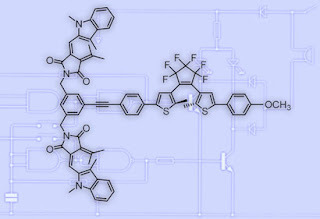 Devens Gust of Arizona State University in Tempe, US, and colleagues in Sweden and Spain, created a molecule which can perform 13 different logic operations. Some of these operations can work in unison and the whole process is controlled entirely by different wavelengths of light. The FG-DTE molecule comprises three covalently linked photochromic chromophores: a dithienylethene (DTE) and two identical fulgimides (FG). Shining different wavelengths of light on the molecule causes photoisomerisation of the three chromophores, thus making it possible to switch each of them into open and closed isomeric forms. To test the system, the team used standard laboratory spectrophotometers and light sources and found that it could perform binary arithmetic using AND, XOR and IHN gates, and decoder and encoder functions required for storing digital information. Military researchers in the US have developed a novel 'green' rocket fuel whose constituents are less corrosive and toxic than those used in conventional propellant systems. Rockets are typically powered by bipropellant systems, where a powerful oxidising agent reacts with a fuel to spontaneously ignite, a reaction termed hypergolic. Oxidisers include nitric acid or dinitrogen tetroxide, which are corrosive and release toxic fumes, with fuels such as hydrazine, which is also poisonous and highly unstable. Stefan Schneider and colleagues at the US government's Air Force Research Laboratory at Edwards in California believe they may have solved this problem using a hydrogen-rich ionic liquid - a salt that is in the liquid state - as fuel with hydrogen peroxide as the oxidiser. The use of ionic liquids to liquefy metal hydrides for use as a fuel has been tried before, but their reactivity has been insufficient. Schneider's team reasoned that combining an ionic liquid with aluminium borohydride to create complex anions, such as Al(BH4)4-,would, in effect, create a densified form of hydrogen stabilised by metal ions. The researchers took trihexyltetradecylphosphonium (THTDP) chloride and substituted the chloride anion with a borohydride anion. The subsequent (THTDP)BH4 was reacted with an excess of aluminium borohydride to produce a room temperature ionic liquid incorporating Al(BH4)4-. In tests, this was shown to react hypergolically with hydrogen peroxide. 'This new class of ionic liquids holds the potential for enabling high-performing, non-cryogenic, green bipropulsion for the first time,' the researchers say. The Royal Society of Chemistry (RSC), which contributed to the report, says that emissions targets could be missed if the UK fails to formulate a plan for strategic metals. 'The UK government has said that, while moving towards a low-carbon transport infrastructure, priority will be given to the use of biofuels where no alternatives are available, such as aviation,' says Brian Carter, RSC environmental sciences programme manager. 'This will place additional emphasis on the use of electricity to power cars.' This means new lithium mines are needed and technologies to recycle lithium, he adds. Recycling these metals from waste electrical and electronic equipment (WEEE) is one way to reduce the UK's dependence on overseas mines. According to the report, 90 per cent of collected waste is recycled and substantial quantities of platinum, rhodium, palladium, gold and silver are recovered. However, there are still concerns that many useful metals are being lost in the remaining 10 per cent. To improve this, a cradle-to-cradle approach is needed with manufacturers encouraged to create products that are simple to disassemble and recycle once they reach the end of their working life. The 'fugitive imports and exports' in our waste stream need to be better understood so we can make the best use of our scarce natural resources, says Mike Pitts, the RSC's champion for sustainable product design. 'In previous years the focus has been on the carbon economy, but carbon's just one of eighty-odd elements whose movements we should be keeping a close eye on. 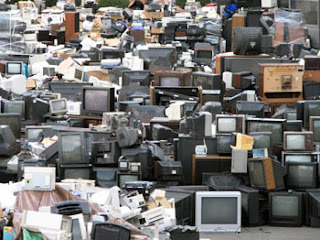 However, recycling WEEE also has an environmental dimension. Much of the UK's waste electrical goods are sent to developing countries to be recycled resulting in pollution, as well as the loss of valuable metals. The committee call for stricter policing of such activity. What inspired you to become an environmental scientist? From an early age, I was influenced by my father who gave me gifts that inspired my curiosity. At one time, I had a gigantic chemistry set and used to do the experiments in the garage. I later went on to study chemical engineering. In the late 1960s, there was a race to the moon and a race to the bottom of the ocean. Jacques Cousteau was very active then and, almost on a whim, I decided I wanted to study ocean engineering. At that time, the Vietnam War had started - I was advised that it was better to volunteer than be drafted, so I volunteered for the navy civil engineer corps and became a deep sea diver leading a team in underwater construction. By the early 1970s, the US Environmental Protection Agency was founded and the Clean Water Act was passed. Around this time, I read Rachel Carson's book about the dichlorodiphenyltrichloroethane - or DDT - problem, Silent Spring. Being in the military gave me time to think about my future and environmental issues and I decided that on leaving the navy, I would do a PhD in environmental engineering. I've always had an interest in physical chemical processes and in trying to understand what mechanisms are at work in environmental systems such as sediments and wetlands. Everything is connected in natural systems - some connections are more important than others and we need to try to quantify these. 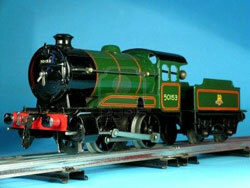 The use of modelling can then enable you to make predictions about the system. 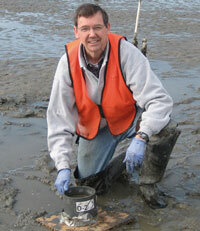 My work is focused particularly on water quality. What's the most exciting thing about the work you do? I enjoy working with colleagues from other disciplines, including biology and the social sciences. We're looking at how to manage contaminants in sediments and I've learned a lot about aquatic biology, which you need to understand as well as how compounds are taken up and how we can control the availability of contaminants in sediments. Better management and use of our water resources are two of the most important problems in the western United States. It has been exciting partnering with excellent colleagues in the various disciplines and by working together, we have been able to put forward proposals to address the challenges ahead. What's the next big challenge? In California, the water infrastructure is old, fragile and needs replacement. Back in the 1950s, we pumped water all over the place but now we've got to think about energy costs and the competing needs of agriculture and other human activities. Of course, part of the solution will come from technology that requires less energy. We are also thinking more about ecosystems. For example, the issue is no longer about not killing fish with discharge from wastewater treatment plants, we now have to consider how to leave the fish with enough water to live in. Ecosystems have an equal claim to water as industry and agriculture and we have to find a way of satisfying these competing claims. There are issues with regard to management and institutions. In California, there are around 500 different major water suppliers, each with their own pricing structure. That makes it difficult to introduce a new water process or system since you have to discuss the changes with all those different bodies. Also, we view groundwater as a separate entity to surface water, but they're connected. Having one set of laws that govern groundwater and another set for surface water makes the management of both resources much more difficult. Financial costs are the biggest hurdle in introducing improvements in water reuse, so it's important to have business models that help us recover these costs. Another issue is how we deal with climate change and risk in the future. There are risks from natural phenomena and from intentional acts and in the end you want a system that is robust and resilient. In the field of water quality and supply, we can either do things differently or just keep muddling along. Human society needs water and changes will happen anyway in how we maintain our water supplies, but ideally you like that change to happen in a way that is well planned, cost effective and serves the various needs I've described. What advice do you have for younger scientists? It helps to have lots of different jobs when you are young. Work experience is valuable and helps you learn about what you'd like to do in the future and other aspects of life: how to deal with people, customer service, how organisations work. In my opinion, it's always good to stick with a technical field - technical expertise opens doors - it doesn't mean you have all the answers but it does give you skills that can be applied. Also it's not always easy to know which option to choose. Sometimes it probably doesn't matter - just try to avoid making bad decisions. Is there a historical character you admire? In the environmental water field, John Snow and the case of the Broad Street Well is particularly well known. He lived around the mid 19th century and studied an outbreak of cholera in London. He was a doctor and did some chemical and microscopic analysis of the water but he also spoke to the people about where they got their water from to find out what these people affected by the disease had in common. He started to map the disease outbreak and was probably the first epidemiologist. He discovered a contaminated well and linked it to the source of the disease and was the first to demonstrate that disease could spread from contaminated water. That was the start of what we would now call environmental engineering. What do you enjoy doing when you're not doing science? If you ask my wife, she'll tell you that I'm pretty focused on my work. I run on a regular basis and I also like my garden. I have some citrus trees and grapes. I don't have a lawn anymore since in California woodchips are better for water conservation. I have a lemon tree and various kinds of oranges and oaks. I like watching things grow. Did you always know you'd be a scientist? If you told me in high school or college or even when I was in the navy that I was going to be a professor at a renowned university I wouldn't have believed you. You just don't know where your career is going to take you. However, my sister once told me that she saw it in the cards years ago, when I was in high school, and she said now I just have a bigger chemistry set! Your family can often see more than you can about yourself.